There’s something to be said about a live-action comic book story that actually feels like it derives from a comic book. Ever since fans turned out in droves wearing costume cowls and homemade utility belts for Christopher Nolan’s Dark Knight trilogy in the late aughts, the superhero genre has often associated “darker” with “better.” It seems like every other blockbuster is fighting to be a little bit harder, and a little bit grittier, than what came before. Zack Snyder’s three-hour happiness lobotomy Batman v Superman: Dawn of Justice is the zenith of the trend; even Marvel Studios embraced its darker side with Captain America: Civil War, though that bright Marvel gloss still shone through in the end. Judging by tentpole films, you might think comic books are a dour, depressing medium in which everyone’s miserable and not even the Big Blue Boy Scout can crack a smile. But they’re not: Comics, even when limited to releases from the Big Two, Marvel and DC, are a varied and colorful lot. There are wacky adventures, time travel shenanigans, character studies, silly side stories—and sure, a few tales of woe, too. But not every story makes you squint to distinguish the heroes from the inky black sky behind them. So it’s notable that a rare respite from this grim-dark overload, which also includes Marvel’s Netflix series, if not their ratings-challenged (but still entertaining!) ABC counterpart, Agents of S.H.I.E.L.D., has come from one of the most idiosyncratic networks on the dial, The CW. Over the past five years, the network, born from a merger of The WB and UPN in 2006, has taken full advantage of its close ties with Warner Bros. to hand over much of its primetime slate to DC superhero shows, and it’s one of the most fun line-ups on television. There’s Barry Allen zipping around National City in The Flash, taking out bad guys with a quip and a smile. There’s Supergirl, one of the only female-led superhero shows out there, fighting evil aliens and the patriarchy. There’s also Legends of Tomorrow, which is pretty much what Doctor Who would be if it were ten times dumber and twenty times goofier, though the former no doubt lost some viewers during those Season One doldrums. And, for the most part, the ratings suggest that audiences agree. Supergirl’s CW debut (after airing on CBS last season) put up the highest timeslot numbers the network had seen in years, while The Flash is consistently one of The CW’s highest-rated series. The exception that proves the rule may be the one CW superhero show that isn’t quite like the others, and even though it started the train down the tracks, it seems viewers are finally starting to jump off. Arrow, based on the Green Arrow comic run, debuted in 2012 as, essentially, a small-screen homage to Batman Begins. It mimicked Nolan’s super-serious tone note for note, and at the time it was a ratings smash. 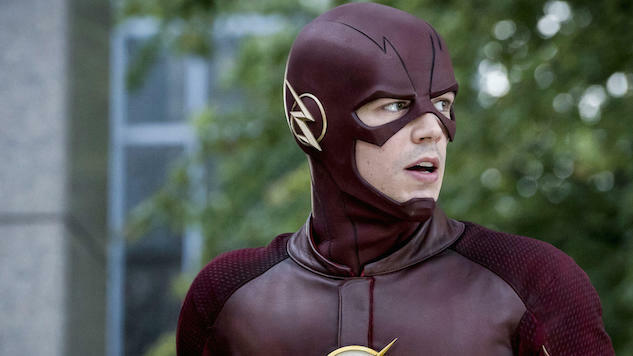 The show was such a success that it served as the foundation for The CW’s own shared universe, with The Flash’s Barry Allen being introduced in a backdoor pilot before getting his own (more successful) series, while several key characters were spun off from Arrow to front Legends of Tomorrow. With its ground-level story of a Batman-esque figure—replace the utility belt with trick arrows—trying to clean up mean streets, Arrow obviously skews a bit darker than something like The Flash. For a while, that was fine. But now it seems like The CW’s superhero slate is leaving its forebear behind, and you have to wonder how much longer Arrow will fit into the universe it created. Still, these changes have largely just muddled the tone. Which is understandable, because it’s hard to balance wackier elements with a hooded vigilante stalking downtown and shredding villains with a hail of arrows. Sometimes they just don’t mix, and with the Season Five premiere of Arrow down an eye-popping 36 percent from last year, you have to wonder if fans are growing tired of the grim and gritty playbook that made shows like Arrow and movies like The Dark Knight so successful in the first place. More than a decade on from Batman Begins, the genre, at least in its darker complexion, has become the victim of its own success: Now, it’s live-action comic book stories that are true to the source material’s goofy, bright, silly—and, sure, sometimes dark—roots that are on the rise. Dating back to some of the first successful comic book movies of the modern era, like X-Men and Blade, filmmakers and studios hung their hats on not making the comic book movie look like a comic book. X-Men director Bryan Singer has said as much, telling Collider that he tried to find the story in the comic book format without leaning too heavily on the actual comic elements. In the early 2000s, that wasn’t the worst idea, because the genre hadn’t proven itself at that point. These films looked like any other PG-13 or R-rated action movie, and most moviegoers were none the wiser. That’s not the case anymore. Audiences turned out in droves to see Doctor Strange bring comic artist Steve Ditko’s trippy, surrealistic pages to cinemas, and even a quirky superhero team-up like Guardians of the Galaxy can be a box office smash. Over the past few years, The Flash has tackled everything from the classic Flashpoint storyline about alternate realities to the giant, super-intelligent Gorilla Grodd, and fans are eating it up. Legends of Tomorrow has seen the team kidnap Einstein and slug it out with dinosaurs—and that’s just in the first few weeks of the current season. At heart, comic books were designed as a fantastical distraction from everyday life. That doesn’t mean they can’t tell meaningful stories that push us to reexamine our world, but it’s taken time for the balance we see on the page to make the leap to the screen. With big-screen superhero stories becoming so bruising, both mentally and physically, small-screen comic stories are now a light-hearted oasis for fans just looking to have a good time, with a little angst thrown in for good measure. Trent Moore is an award-winning journalist and professional geek. You can read more of his stuff at Syfy’s Blastr, and keep up with all his shenanigans @trentlmoore.